He might be a very naughty boy, but he could also make you a lot of money. 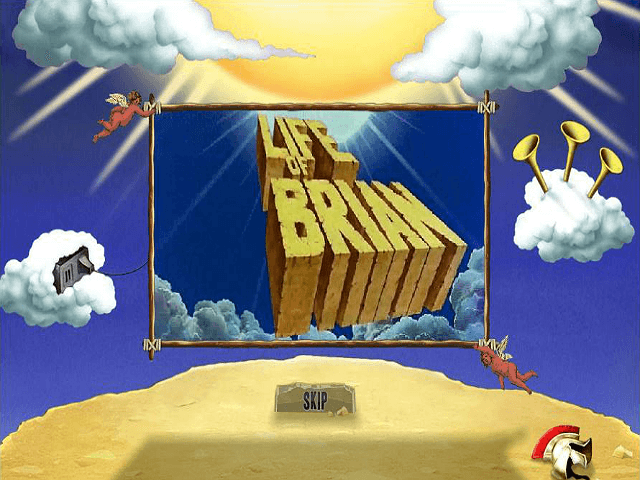 The hilarity of the Monty Python film about someone who most certainly isn’t the Messiah serves as the (almost) divine inspiration for this Monty Python's Life of Brian online slot. The familiar faces of the Python team and their iconic imagery are all present and correct, providing plenty of comedic potential throughout. Just don’t mention the Judean People’s Front. Something else that might bring a smile to your face is the fact that Ash Gaming's offering also has a slightly higher than normal payout percentage. This is mainly due to the fact they're owned by Playtech, but the important point is that you're in with a better chance of cashing out. Play Monty Python's Life of Brian for Real Money! As it’s based on arguably one of the most influential and downright hilarious comedy films of all time, you'll find off-the-wall Python humour everywhere you look in this online slot. There's even the Python team themselves: Eric Idle, John Cleese, Michael Palin, and Graham Chapman, portraying characters from the films like Brian's mum and the unforgettable (?) Centurion. Graphically, it's simple but clear. The images of the characters are instantly recognisable, and the desert setting will soon have you remembering the famous scenes of the film. There's even the theme tune which plays as the game loads, as well as 'Always Look on the Bright Side of Life’, as you spin. Particularly apt if you've had a bad run. 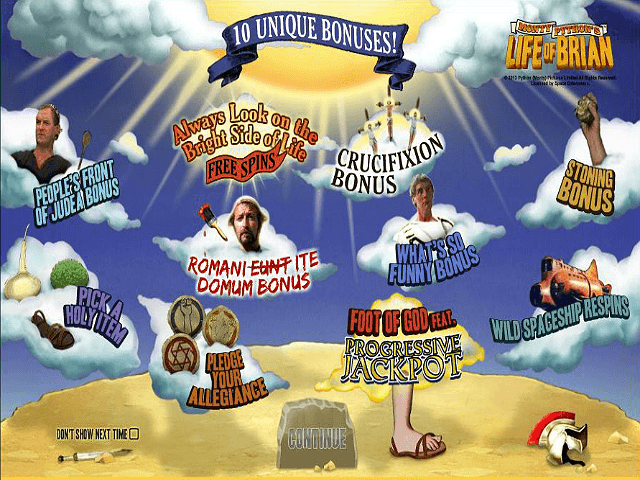 Fortunately, there are a lot of Monty Python's Life of Brian bonuses too, which we'll look at a bit later on. Suffice to say, there are plenty of possibilities to make sure you come away looking very much on the bright side after a few heavenly wins. This slot game features five reels for a total of 30 paylines, and you can set your stake at anywhere from 0.30 coins to 300. In terms of symbols, as is the norm for most slots, you'll find that the letters and playing card symbols offer the lowest payouts, so you want to try and match up the film characters themselves. There's also a progressive jackpot, which means you might even be able to finance your own film if lady luck swings your way. Even if you don’t make the big win, the huge amount of bonus modes gives you lots of opportunities to live more of a life of Riley than a life of Brian. 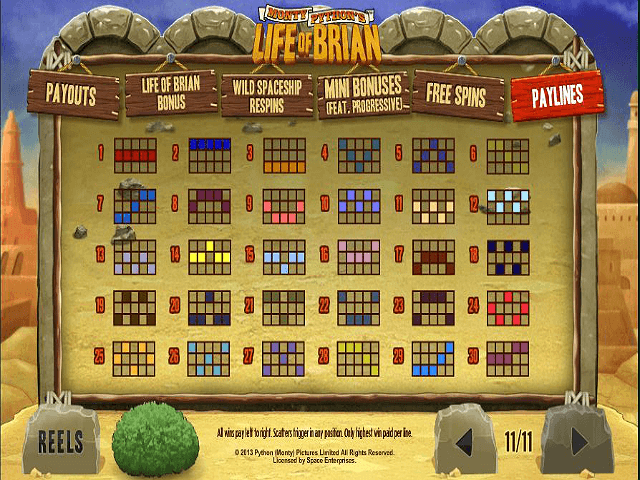 There are so many bonus modes in this slot, there isn’t space to go through them all in detail, but suffice to say that in addition to the film logo ('The Life of Brian') being the wild, there are bonus and free spin symbols to watch out for too. The easiest way to sum up the many bonus modes (which are in general activated in the ways you might expect – the bonus symbol on reel one, three and five triggers the Life of Brian Bonus mode, for example) is that there are multiplier games and pick me games. Either way, the huge variety is more than enough to keep you laughing (especially the stoning game), as well as winning. If you're a fan of Monty Python and his films, also make sure to check out the ever-popular Monty Python's Spamalot slot game. 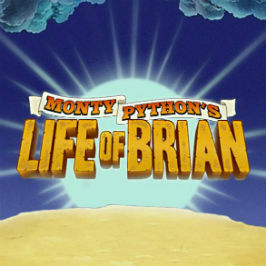 Share this Monty Python's Life of Brian Review today! 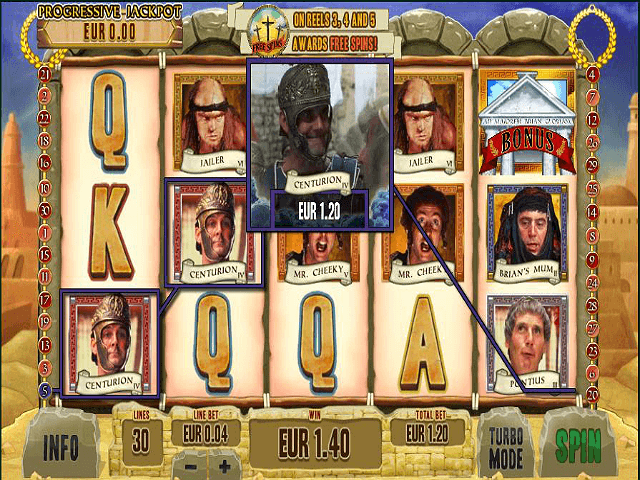 If you like Monty Python's Life of Brian, you'll love these slot titles too!